Jack Daniels miniature bottles - 5cl of the famous stuff! 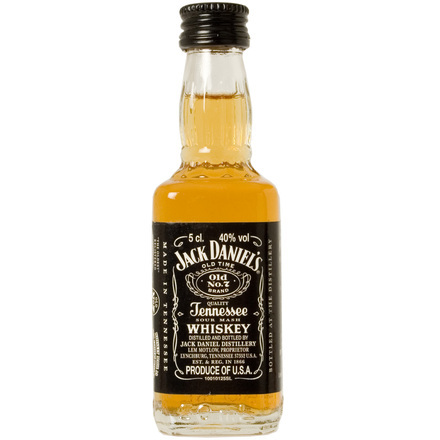 With that distinctive flavour so reminiscent of the American Deep South, and with a smoothness and depth as enjoyable as an evening in the warm summer sun, this perfectly proportioned detailed miniature bottle contains 50mls of Jack Daniel’s Whiskey. With an aroma and colour to be savoured, inside the cute miniature glass bottle they’ll find exactly the right measure for a double...or two singles of course! The perfect treat for anyone who needs a little pick-me-up, or in fact anyone who is a bit of a fan of this famous Tennessee tipple! Not forgetting the legal stuff - you are only able to purchase any of our products which conatin this Jack Daniel’s miniature if you are over 18, and you are only allowed to send or give it to a lucky someone who is over 18 years old too. So why not treat someone to a generous tipple alongside something yummy to eat - the perfect combination of treats which might just be the ideal Father’s Day gift, or a fabulous way to send your Happy Birthday wishes from a-far!